Why not try something new for dinner tonight? Head out to the Village of Lewiston, to one of its local gems: Carmelo's Restaurant. If you want to try something fresh and exciting using the region's local ingredients, you don't have to look any further. Chef and owner Carmelo Raimondi prides himself on his technical dishes and flavors that you can't find just anywhere. Carmelo's Restaurant takes it to the next level by offering dishes that you can't just easily make at home. Carmelo's is a cozy and quaint restaurant, with intimate lighting to enhance any dining experience, whether it's personal or business. Though money is an issue for most college students, fret not: This restaurant has a fine dining flare that you can afford. The first item from the menu that I tasted was the pork meatballs, which were once featured on WKBW Channel 7 in Buffalo ($9). Made from fresh T-Meadow Farms pork, these may have been the best meatballs I have ever tasted. 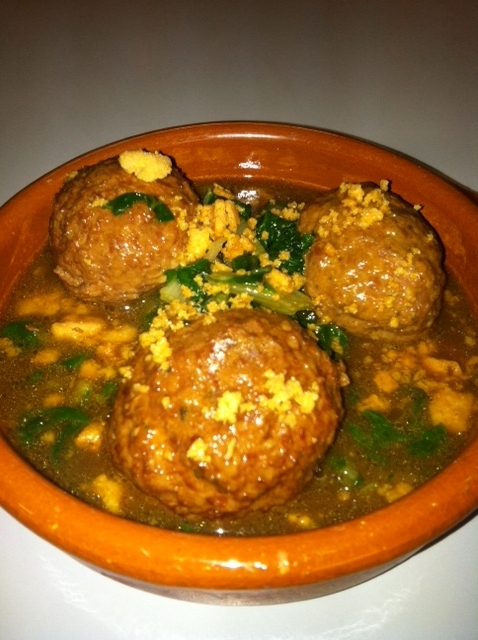 With three meatballs to an appetizer (each golf ball size), they are the perfect start to your meal. They are served with mustard greens and a savory au jus. They are addicting and have a little bit of heat to them. Next, I enjoyed a baby arugula salad, previously known as a Carmelo salad ($7). 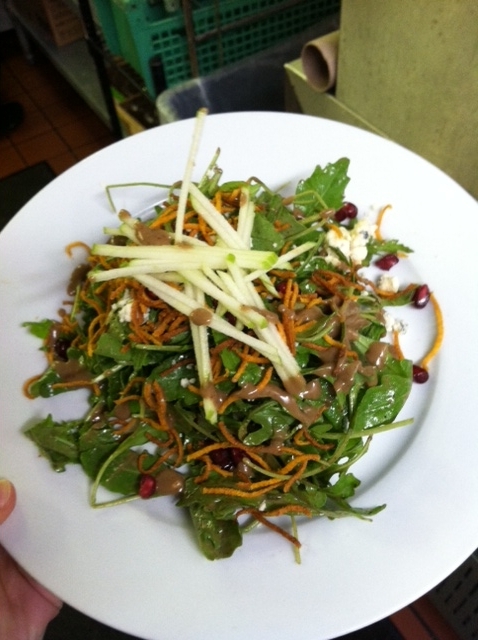 The salad consisted of arugula, fried yam sticks for salt and crunch, smoked blue cheese, sweet pomegranates, shaved Granny Smith apple, and a creamy balsamic basil dressing. The combination of these ingredients makes for a mouthwatering surprise. The sweetness of the dressing outweighed the bitter arugula and smoked cheese. The yam sticks gave it the saltiness and crunch it needs, without being a boring crouton. The portion size is also very big for a salad. 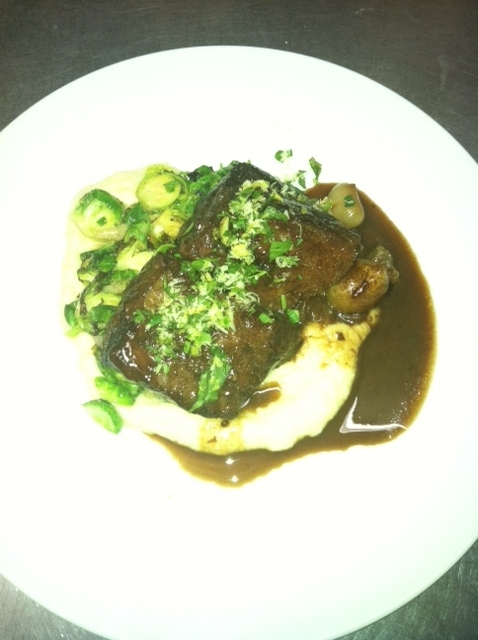 My entree consisted of the polenta braised short ribs ($22). This is a traditional Sicilian dish, made with creamy polenta, which is ground corn. The fresh garnish of herbs, lemon and garlic on top made the smell sensational. The rich polenta and melt-in-your-mouth short ribs were a perfect match. If you are looking for a different dish than pasta (which is what most people I know get at Italian restaurant), this is the dish for you. I also tried another selection. If you enjoy a nice cut of meat, try Carmelo's blueberry filet for $38. Yes, it may be on the pricey side for college students, but its something worth trying. 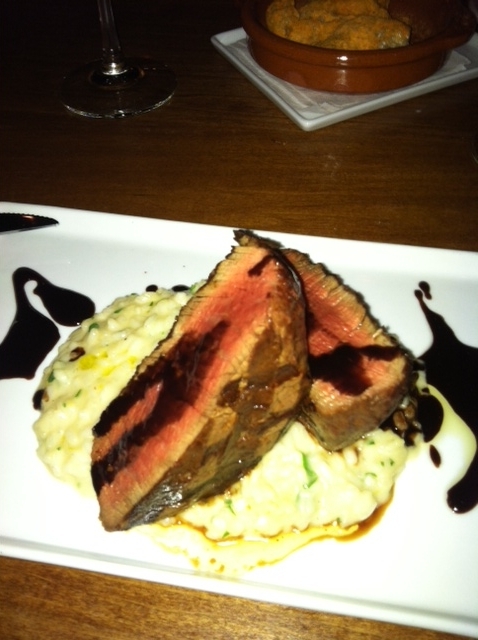 It is made of a center cut filet mignon, lemon marscapone risotto, and a balsamic blueberry reduction. Risotto is an Italian rice almost like a pasta, because it is so thick. It is cooked in stock and then mixed in with fresh lemon juice and marscapone cheese, which is similar in a way to cream cheese or greek yogurt. The filet is grilled to your liking and served on top of the risotto with a sauce composed of balsamic vinegar and fresh blueberries. The meat is moist and tender, and the creamy risotto gets the kick it needs with the acidic blueberry and vinegar sauce. The dessert that I tried was the Carmelo's chocolate bar, which has become Raimondi's signature dessert ($7.50); not to mention Carmelo's Restaurant won best dessert menu from Buffalo Spree in 2012. 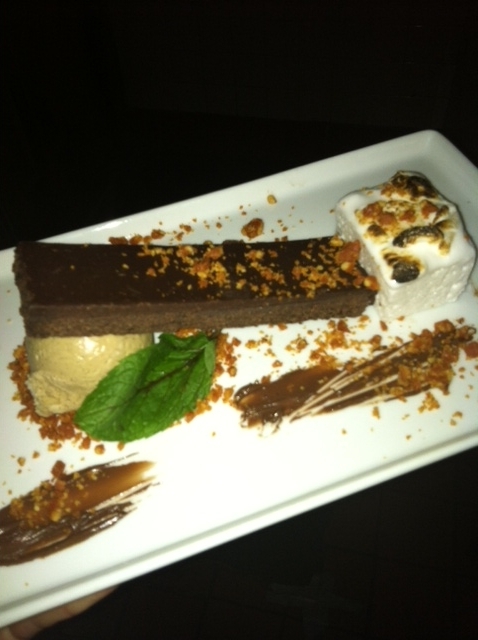 This savory dessert consisted of homemade, flourless chocolate cake, homemade marshmallows, homemade cardamom espresso ice cream, homemade caramel crunch, and finished with a piece of fresh mint. This dessert is one-of-a-kind, all-over goodness. The five different parts all come together and create a beautiful pallet. How many restaurants actually make their desserts from scratch? Carmelo's Restaurant does! Raimondi wants his patrons to know that "It's an exciting year. I resolve to keep you in the loop with all that is happening at Carmelo's - special events, new ingredients and spirits. 'Like' us on Facebook and you'll get it all." You can find Carmelo's Restaurant on Facebook at https://www.facebook. com/Carmeloslewiston. Carmelo's, 425 Center St., Lewiston, is open Tuesday through Saturday at 5 p.m. It's closed on Mondays in the winter, but will reopen on Mondays in June. Carmelo's is always closed on Sundays so that patrons and staff can spend time with their families.